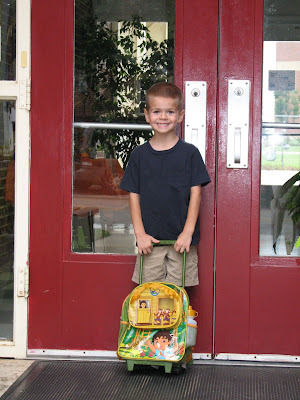 I can't believe The Politician's in Pre-K. Today was his first day in his new class. He's been at this early childhood development center since he was 6 weeks old, so he is really comfortable here. In fact, I think he pretty much runs the place and is certainly the class clown. The Wild Child isn't moving classrooms until Christmas, but I took a shot of her too today since she got her haircut this morning and was in a good mood- gotta take it when you can get it. P got a haircut the other day too- just in the backyard. P didn't even notice when Mr. Sasha and I left his classroom- he was busy chatting with his buddies and being excited about his new room. He's such a big boy these days. gotta love those backyard hair cuts. Abby has never had hers cut, even though I think it could use a trim, I just can't bring myself to do it. Your boy is so tall!! Is he extra tall for his age? WC and the P look great in that photo!!!! Look how happy WC looks! P is actually already 5- but his birthday is only 2 weeks before the deadline here, which is Sept 1, so we decided not to start prek until he was 5. I can't imagine graduating from high school at 17! He is in pre K or Kindergarten? That child is tall.. WC is precious, and he is handsome. How cute are they???? It almost makes me want another one .... and then I wake up! He looks so happy with his Diego back pack! I hope he had a great day! Since BLM has the August bday as well, we did pre k at 4, kindy at 5, and pre-1st at 6. For the same reason as you. Do not want a 17 year old graduating from HS. We will do the same with LLM and her July birthday. I just think she'll need that extra year. Yay, glad the first day went so smoothly. Both your children have beautiful smiles, Sasha!